Gault&Millau is one of Europe’s most influential and respected restaurant guides. Implement an end-to-end digital, responsive, publishing solution, including interfaces for judges and eCommerce & subscriptions. Ongoing optimisation, traffic and online marketing programs. In Europe, so well regarded is Gault&Millau that when referring to a chef, people merely talk in terms of the chef’s Gault & Millau rating. A number between 0 and 20 which can make or break a restaurant. A number that tells you everything you need to know. Gault&Millau uses a complex though standardised scoring system, focused more on the food of a restaurant than the service or ambience. The system means that qualified and trained Gault&Millau critics will consistently and impartially score restaurants, removing personal opinion and partiality from the scoring process. To the extent that Gault&Millau is so focused on the food of a restaurant and not much else, it is regarded as the bible across France and Europe. And for 2014, they’ve come to Sydney with the launch of the first of their guide reviewing Australian restaurants. We have a couple of foodies in the team and the opportunity to help launch the guide and its website in Australia was one we jumped at. 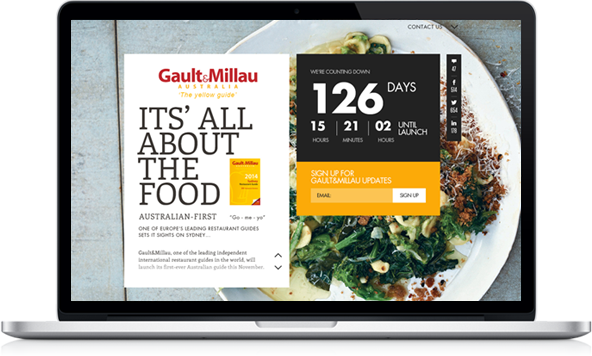 The first assignment was a quick one; to develop an invitation-request and PR site prior to the launch of the main Gault&Millau guide and website in November 2013. The main website is a significant development in itself, though that is for another case study.